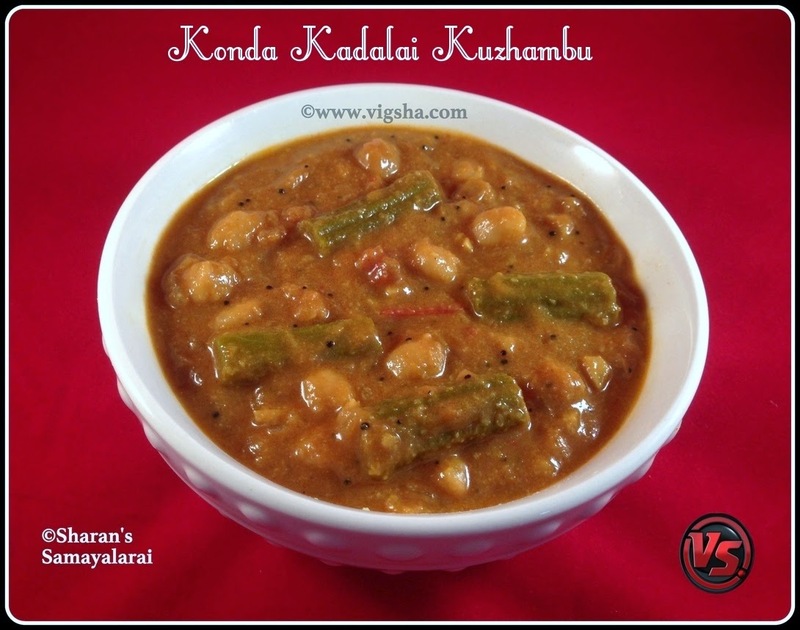 Konda Kadalai Kuzhambu is a healthy and delicious rice accompaniment. It makes a complete meal with rice and does not need any side-dish. Many get confused by the name, this kuzhambu is not the one which we usually have it with idiyappam. This is typical home-style kuzhambu that goes well with rice. 1). 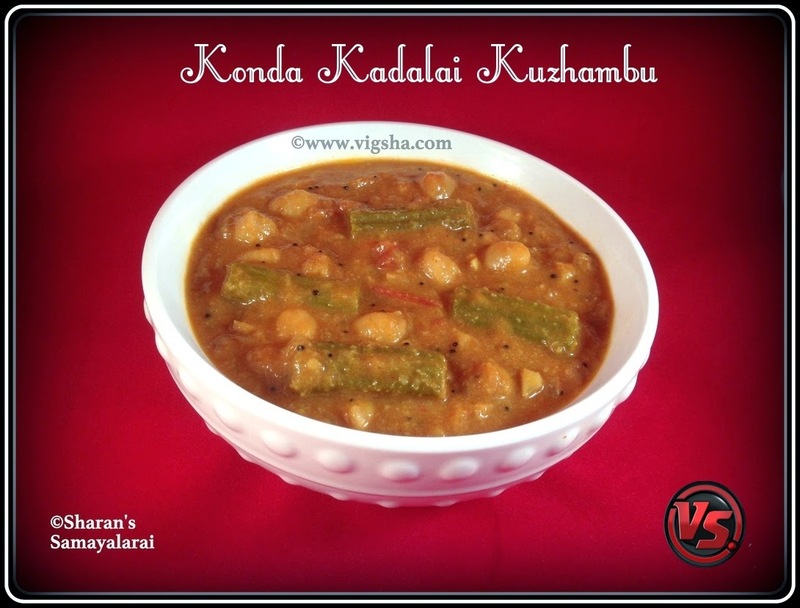 Wash and soak the kadalai (chana) overnight*. Drain the water and pressure cook the channa along with salt and water for 1 or 2 whistles until it becomes soft but not mushy. Set aside. Chop the drumstick into medium size pieces. Soak the tamarind in warm water and extract the juice. Grind the items listed under "to grind" to a fine paste and keep aside. 2). Heat oil in a pan, add mustard and let it splutter. Then add onions, garlic, curry leaves and saute till the onions turn light brown. Then add tomatoes and saute till they become mushy. 3). Add the chopped drumstick along with tamarind extract and a cup of water. Then add turmeric powder, chilli powder and coriander powder. Mix well and let it boil till the drumstick gets cooked. 4). Once the drumstick is almost cooked and the gravy comes to rolling boil, then reduce the flame. Add the boiled channa along with the grounded paste, mix well. Check for salt and spices and adjust accordingly. Let the gravy cook in low-medium flame till it reaches the desired kuzhambu consistency. Switch off ! Serve hot with Steamed rice and Papad. # You can store the soaked chickpeas in the fridge for about 2 weeks or in the freezer for about 2 months and use it whenever needed. # Instead of overnight, you can also soak it in hot water for 3-4 hours. # Channa can be replaced by black eyed peas, white navy beans, mochai etc.,. Similarly you can use any veggies of your choice like Brinjal, potatoes etc..
# Cooking the gravy at low-medium heat (step 4) helps channa to blend with masala. So don't skip.